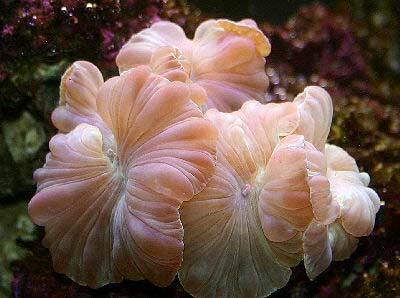 Fox Coral's are absolutely beautiful, and are often mistaken for anemones! This eye-catching coral Nemenzophyllia turbida is the only known species in the Nemenzophyllia genus. It was named after Dr. Francisco Nemonzo, who was a pioneering researcher of Philippine corals. The Fox Coral is also popularly known as the Jasmine Coral, the Ridge Coral, and the Jasmine Fox Coral. The Fox Coral is usually brownish pink or light green. Colonies are flabello-meandroid, meaning they form elongated valleys with separate septa walls. The walls are a thin fragile ridge-like skeleton, and the polyps will expand enormously in the right conditions. With their large striated ruffled polyps spreading out into flower-like shapes, they are occasionally mistaken for anemones. On the reef, the Fox Coral coral inhabits sheltered environments under overhangs in turbid waters. This coral is easy to keep in our experience, although sometimes it is described by others as being difficult. Feeding tentacles have not been observed on N. turbida, and it is believed they tend to get most of their nutrition from absorbing nutrients from the water. This makes the Fox Coral one of the easiest large polyp stony (LPS) corals to care for. Low water movement is required. They do well under a low to medium level of indirect light, and will turn brown if the light is too strong. The Fox Coral is not aggressive. These are very pretty corals that seen to neither sting nor be stung by other tank mates. They are easy to frag, with using a simple pair of scissors to cut their little corrugated skeletal bodies. They regenerate their tissue faster than any other member of its family. They also like gentle turbid water, which in general makes them poor tank makes for small polyp stony (SPS) corals. This Fox Coral is probably the most common color. As you can see, compared to the size of the coral, the clownfish that has taken residence is much smaller and shouldn't bother the coral or cause recession. The 6 line wrasse in the video will help keep pest worms in check too! Minimum tank size is 40 gallons and low to moderate turbid water and moderate lighting like compact fluorescence are fine. Distribution / Background Nemenzophyllia Coral Information: The Fox Coral Nemenzophyllia turbida was described by Hodgson and Ross in 1981. It was named after Dr. Francisco Nemonzo, who was a pioneering researcher of Philippine corals. Other names this coral is known for are Jasmine Coral, Ridge Coral, and Jasmine Fox Coral. The N. turbida is the only known species in the Nemenzophyllia genus and it has been propagated successfully in captivity. Where Nemenzophyllia Corals Are Found: N. turbida are found in the Indo-West Pacific Ocean from the Philippines to Java and then from Indonesia to Papua New Guinea. Nemenzophyllia Coral Habitat: The N. turbida live at depths down to 98 feet (30 M) or shallower. The habitats they are located in are sheltered reef environments under overhangs in turbid water. Status The N. turbida is not on the IUCN Red List of Endangered Species. Description What do Nemenzophyllia Corals look like: The skeleton of the Fox Coral N. turbida is wall like and wafer thin, which leads to it being very delicate and breakable. The long hollow "corrugated" bone structure almost looks like little rectangular boxes from the top. Each "box" forms polyps within them and this fleshy part of the coral cannot fully retract in mature specimens due to its large size. Smaller and younger polyps can retract into the structure almost completely. The Fox Coral is usually cream to light green. The polyps fold outward and there are striations in the tissue that radiate from the center out toward the ruffled edges, almost looking like a flower. Some colonies of N. turbida can possibly reach over 3 feet (1 m), but there has not been enough research to know what the ultimate size of this coral would be. Lifespan is unknown. Difficulty of Care Nemenzophyllia Coral Care: The N. turbida can be easy care for. Water flow should be gentle to moderate and turbid, containing dissolved nutrients. They do quite well under standard fluorescent lights. Stronger lighting, like HO and metal halide must be filtered. You can put your Fox Coral under an overhang to protect it from this type of bright lighting. Lighting that is too bright will result in the coral turning brown. Foods / Feeding Nemenzophyllia Coral Feeding: This coral, like other large polyp stony (LPS) corals, has developed several feeding strategies. Through a symbiotic relationship with a marine algae, known as zooxanthellae, they may receive some of their nutrients. Feeding tentacles have not been observed on N. turbida, so it is believed that they tend to get most of their nutrition from absorbing dissolved organic matter. In captivity, the N. turbida can be fed microplankton or brine shrimp once a week. Because they tend to get most of their nutrition by absorbing nutrients from the surrounding water, they are best suited to aquariums with less efficient filtration and less aggressive skimming. Aquarium Parameters A well-feed live rock/reef environment is what is needed for your Fox Coral, along with some fish for organic matter production. This coral will not thrive in a pristine environment as it uses absorption of dissolved nutrients to survive. Do not over skim so as to leave enough nutrients for it to absorb. A mature tank is recommended. Be sure to have proper water movement, a low water movement is what is required. Provide sufficient lighting. They do quite well under standard fluorescent lights. Stronger lighting, like HO and metal halide must be filtered. You can put your Fox Coral under an overhang to protect it from this type of bright lighting. This coral is not aggressive towards other corals. Compatibility and Social Behaviors The Fox Coral is not aggressive and is peaceful to pretty much all surrounding corals. These are very pretty corals that seen to neither sting nor be stung by other tank mates. Although the N. turbida does not seem to be affected by other corals, it does have an intolerance for hair algae and strong water movement. Requiring a low gentle water flow, in general makes them poor tank makes for small polyp stony (SPS) corals, which need strong water movement. Breeding and Reproduction The large polyp stony (LPS) corals are male and female and can reproduce both sexually and asexually. In the wild they reproduce sexually by releasing eggs and sperm at the same time, resulting in a fertilized egg which then forms into a free-swimming planula larva. Eventually the planula larvae settles onto the substrate, becoming plankters. This then forms a tiny polyp which begins to excrete calcium carbonate and develops into a coral. Planula larvae are extremely vulnerable to predation, and very few survive. The N. turbida reproduce asexually as well. They use asexual fragmentation, but its success depends on the coral's ability to heal. Propagation can be done by carefully cutting between individual polyps through the very delicate and easy to sever skeletal structure. Make sure the polyps have retreated so as not to accidentally cut the flesh. Glue the frag to a plug or rock. You can use the 2-part epoxy or underwater putties.The slime that the coral will exude should not come in contact with any other corals and gloves are suggested. Potential Problems The N. turbida are fairly hardy, but are sometimes susceptible to brown jelly infections and intense lighting. Also, at time there may be tissue recession of a polyp, but it does not seem to affect the rest of the colony. Brown jelly looks exactly like it sounds, and can be caused by poor water quality and/or tissue damage. To treat, remove the coral to a container with water from the main display, then brush or siphon off any visible brown jelly. Give the coral a freshwater dip in water with the same pH and temperature as the main tank for several minutes to kill a lot of the microorganisms. Do not place directly under HO or Metal Halide, this lighting must be filtered or your Fox Coral will turn brown. You can put your coral under an overhang to protect it from this type of bright lighting. Availability Nemenzophyllia Corals for Sale: The Fox Coral N. turbida is very easy to find at pet shops and on line. Online they can run about $49.00 USD or more depending on size and/or color. I have very nice large group of Fox coral that I have had in my 125 gal. tank for 5 months now, low in the tank and under metal halide lighting. Look like large puffy pillows during the day. Use Dt's and marine snow for food. Give them lots of room as they expand about 5 times their size during the daytime. Under low flow as well. Easy and beautiful coral. I have kept the Fox Coral in my 150 gallon reef tank for about 8months and it has done excellent under metal halide lighting also comes out to its full extent and it looks incredible. Recommend this coral to anyone who is trying to keep it. It's one very attractive coral.